Designing a small kitchen? In an ideal world, we would all be cooking in spacious kitchens with beautiful kitchen islands and large pantries. In reality, most kitchens are small, especially (though not exclusively) those in rented accommodation. Luckily, even a very small kitchen can be made an agreeable space to cook in with a little bit of imagination. Follow our guide to storage ideas for small kitchens and enjoy a kitchen that is snug and cosy, not pokey. From storage cabinets to shelves and jars, we have every size, shape, and style of kitchen storage covered. In a small space, more is always more where it comes to storage, with smaller storage items often more practical than one large piece. This eclectic mix of plate shelves, cabinets, and trolleys from Ikea creates a lived-in but not too busy effect, with everything in its right place. For ultimate flexibility, why not try a modular storage option? The idea is working with the space you've got, building up your storage as you see fit. The colourful and verstaile modular storage by USM (shown below) can be assembled and used in lots of different ways; in this kitchen, it doubles up as a stylish breakfast bar. Brighten up plain shelves by lining them with colourful wallpapers and fabrics to create an appealing background for your crockery. We like these delicately printed multi-use fabrics from Vanessa Arbuthnott. They are pretty and practical, and can be wiped clean. Not everyone likes displaying their crockery. Besides, in a busy kitchen used by several people at once, an open shelf can mean an accident waiting to happen. If you prefer a streamlined look, with all your plates and jars protected, choose a wall storage option with sliding panels. This option works particularly well if your kitchen doubles up as a dining room. This kitchen diner's wall storage is hidden behind cover panels from Ikea. Small houses rarely come with a utility room, and many of us end up with a drying rack constantly up in the middle of the living room or kitchen – not great in a small space, especially when you stumble over your washing while trying to get to your morning cup of coffee. There is a solution: a folding laundry airer that is wall mounted, rather than freestanding. Use the kitchen wall behind the door, and forget it is even there when you are not using it. Our favourite is the Bunty Pine Natural Laundry Ladder from Julu. We would all love a huge kitchen with a kitchen island in the middle... but if your kitchen diner living space is too small to accommodate an island, or you are renting and there simply isn't one, consider investing in a small, freestanding option that you can position strategically to suit your layout. Our pick is the durable stainless steel Stenstororp Kitchen Island from Ikea. Empty wall space that's perfect for a set of shelves? If you don't feel like spending time putting up individual shelves, or want to give your kitchen an industrial look, swap wood for a neat, wirework unit. Our pick is the generously sized Restoration Shelving Unit from John Lewis. A full-height larder is probably the single most efficient item of storage in any kitchen, and can comfortably fit everything from kitchen utensils to a vacuum cleaner. If your kitchen is small, but has even a corner to spare, a larder may well fit in there, freeing up vital space elsewhere. The Chichester range of larders from Neptune offers a variety of widths, including a very slim option at just 450mm wide. Storing crockery in a small kitchen can be a bit of a nightmare, especially if you are trying to stuff fragile plates and bowls into tiny cabinets. A neat alternative is putting it all on display – and within easy reach – on long, narrow shelves. Just make sure to put them up low enough to reach the plates easily. 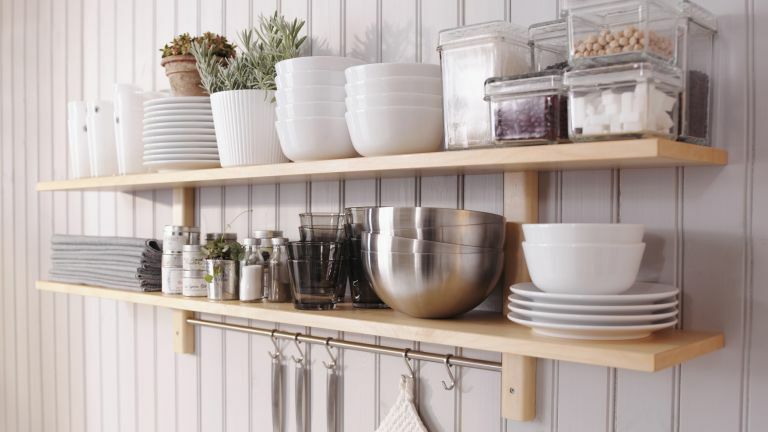 We like the Varde Shelf with Hooks from Ikea. Even in small kitchens, there often are gaps between the fridge and the cooker, say, or a bit of space behind the door. Use that space for an extra-slim storage trolley – you'll be surprised how much you can fit on to a couple of even very narrow shelves. This storage option is especially useful for having your daily cooking ingredients to hand. We bet you'll find room in your kitchen for the very compact Slimline Kitchen Storage Trolley from A Place for Everything. It is only 12cm wide. Microwave on the worktop? Why not consider its storage potential, too? Put a small shelving unit or tray on top of the microwave and be impressed by just how much will fit there. The Microwave Top Shelving Unit from A Place for Everything fits the toaster and coffee machine, and the bottom shelf is perfect for tea towels and fridge bags. Plate drying racks that sit on the drainer take up way too much space in a small kitchen. A wall mounted plate rack, however, not only frees up precious space, but is a display opportunity not to be missed. The Middle Stainless Steel Rack from Stovold & Pogue is sturdy and won't rust, and has a utilitarian look that will add a contemporary twist to your kitchen decor. Available at Not On The High Street. If you can see your storage – which is guaranteed to be the case in a small kitchen – then you want it to be as good-looking as possible. Have fun with kitchen jars that are colourful and come in a variety of materials and sizes. Our favourite range is from Amara. Pots and pans are usually stored well out of sight, but if yours are gorgeous copper kitchen accessories, why not create a display feature with them? The result is not only eye-catching, but also very practical, making reaching for the right pan effortless. We love the way the copperware is stored right above the sink in this Raven Wall Shelf by Williston Forge from Wayfair. Some kitchens are so pared down that that there may not even be an under-the-sink cabinet. If this is the case in your kitchen, create a contemporary look with simple and crisp storage boxes in different sizes. Lidded options are best, but some items will also do well in an open box. We like the versatile Tjena range from Ikea, from £2.25. Sponges, scourers, and brushes can create a surprising (and annoying) amount of mess in a small kitchen, leaving unsightly pools of soapy water around the sink area. Keep your surfaces tidy and dry with a handsome and easy-to-clean metal caddy. The Washing Up Tidy from All Things Brighton Beautiful has three handy compartments – and is good-looking, too. Love your wine, but have no cellar and a small kitchen? A wine rack is a must, but why not make yours work that little bit harder and provide storage for more things than just wine? Choose a storage unit that has a wine rack – or, even better, a wine rack and a wine glass rack. The Signature Wine Rack/Glass Storage Cabinet from The Wooden Furniture Store is an excellent all-rounder with plenty of storage space for wine and an extra storage box on top. One of the challenges that can come with a small kitchen is limited fridge space. Some fridges are way too small to fit in all the groceries, and this is especially true of vegetables, which often come in bulk. The good news is that many vegetables do just as well – and sometimes even better – when stored out of the fridge. All you will need is a couple of sturdy wooden crates – or, if you like a smarter look, opt for this attractive, rustic Spruce Vegetable Store from Garden Trading. Small kitchens, especially those in rented spaces, often come without any wall cabinet storage. On a budget or don’t feel like bothering with installing kitchen cabinets, but still want a wall storage unit? Invest in a wall cabinet that is well designed and not too kitchen specific. This way, you’ll be able to repurpose it for another room when moving. We really like the unique Ferm Living Haze Wall Cabinet, made from powder coated metal and wired glass. It is practical and will look equally good in the hallway or living room.